Tuesday July 18th 2000: This was a special Mets day for centefieldmaz. 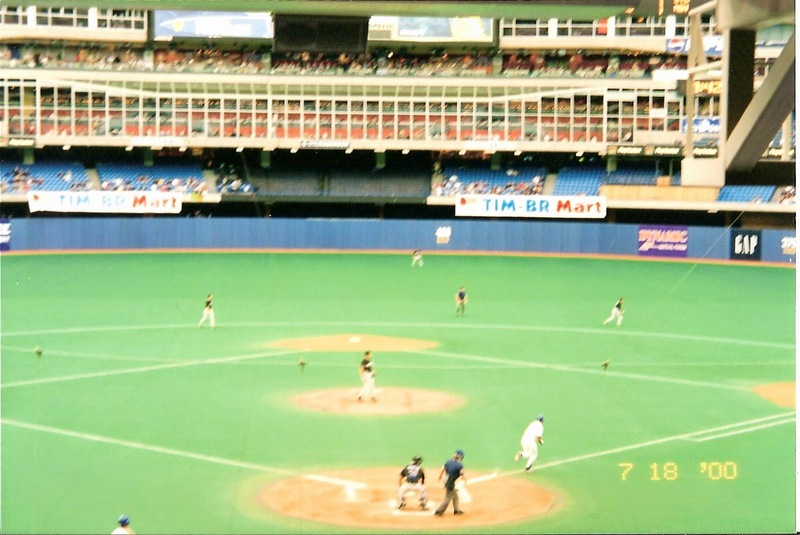 We were in Toronto on a baseball vacation trip to see the Mets play the Blue Jays at Skydome. 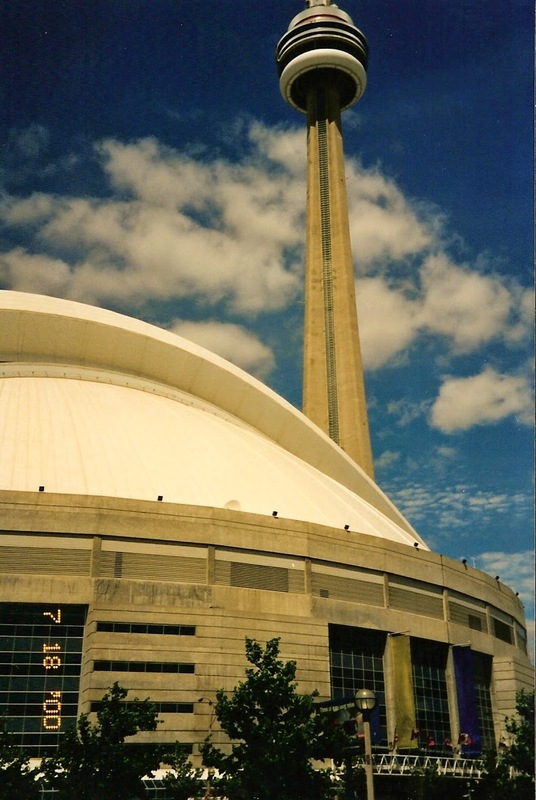 We chose Skydome as our hotel & it was awesome walking into the lobby everyday, seeing the baseball field in the background as workers did the grounds keeping. On a day trip to the Hockey Hall of Fame, a nice guy was pushing his daughters baby carriage & yelled out "Piazza". I was wearing a #31 Piazza shirt so I thought he was ackowledeging me. He said no the real one is in the store.- No way. But Yes, there he was in a sharp grey suit, behind sun glasses, reading a magazine. I yelled over "Hey Mike" he ignored me at first but I didn't go away, "Hey Mike". He looked up & smiled it was him! I was like a kid, he took pictures with me & my girlfriend who all of a sudden was a bigger fan than me. I asked how he was feeling, sincehe was just coming off the DL from the whole Clemens incident. He was a gentleman when I asked him about it, saying it was part of the game. The New Yorker & fan in me said otherwise & he just laughed. We actually got to walked out the store with him & he chatted with us & was very polite. We told him we were up from NY & going to the game. I also told him he & Tom Seaver were the only two names I would wear on my back. 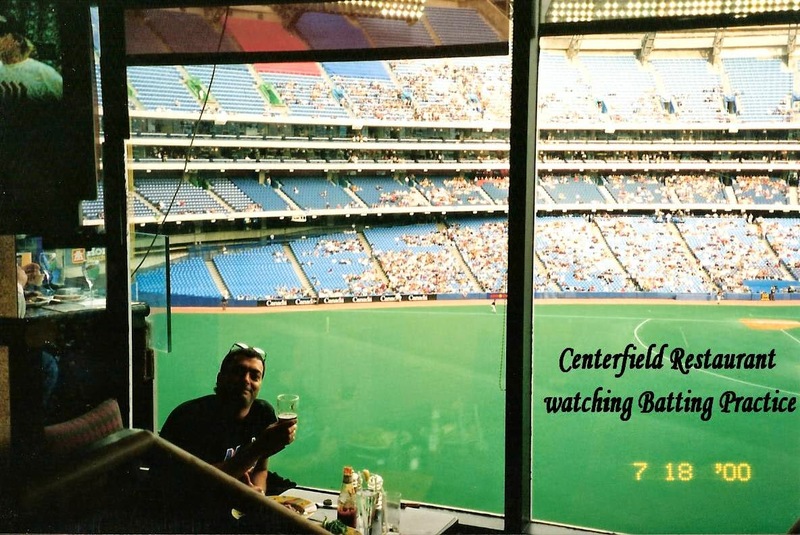 He said "Thanks, I appreciate that"
What a day for a life long Mets fan, after dinner at the Restaurant overlooking centerfield at Skydome, watching batting practice, it was on to the game. This wild game saw Bobby Valentines 2nd place Mets (51-41) go against Jim Fregosi's third place Blue Jays (50-45) quite a good match up. With Bobby Jones going up against Chris Carpenter, neither pitcher did too well. Jones allowed five runs on ten hits in six innings, Dennis Cook, Rich Rodriquez & Armando Benitez, closed it out. Carpenter gave up seven runs, on five hits, with the biggest blow being Mike Piazza's 5th inning grand slam. Sitting right off third base a few rows off the field I stood proudly as Piazza rounded the bases, wearing my Piazza shirt & knowing I just met the guy a couple of hours ago. Wow, what a great baseball day for a life long Mets fan. It was Piazza's third grand slam of the season & his 28th HR of the season. At that point he was batting .348 with 81 RBIs. The Mets went on to a 11-7 victory that night, Derek Bell hitting his 13th HR of the year & Lenny Harris his second HR. Edgardo Alfonzo also had two RBI's as did Bell & Harris. Joe McEwing also drove in a run. The Mets took two of three in the series & won three straight that week. 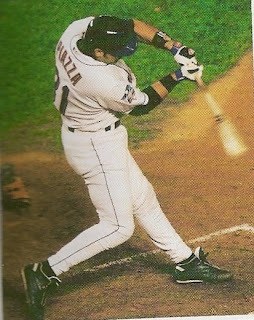 Grand Slam #1- On Sunday May 14th 2000: The Mets (20-19) hosted the Florida Marlins (21-18). Mike Hampton & Brad Penny were having a quality pitching duel going into a scoreless 6th inning. Hampton singled & was driven in by Joe McEwing to make it 1-0. Derek Bell walked & Edgardo Alfonzo was walked intentionally to load the bases. 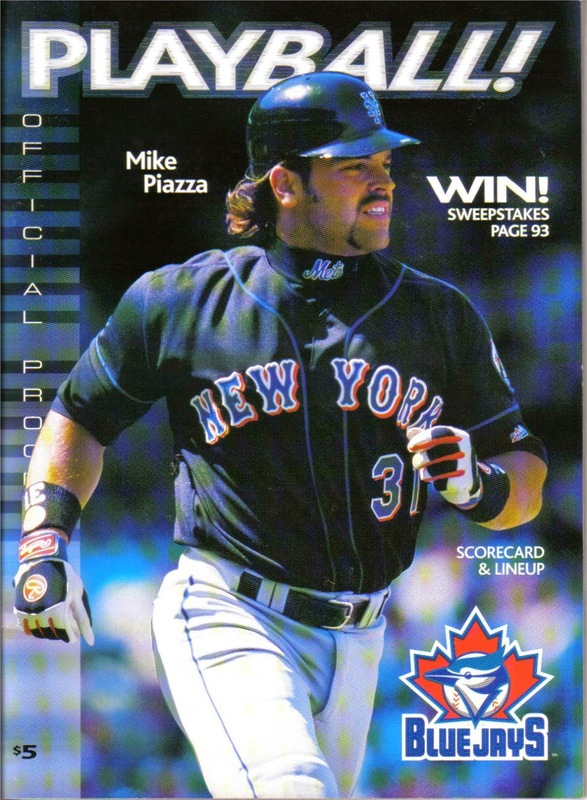 Mike Piazza stepped in & hit his first grand slam of the year, putting the Mets up 5-0. They went on to a 5-1 win, as Hampton pitched the complete game victory. Grand Slam #2- Friday June 9th 2000: The Mets opened up the regular season subway series with a 12-2 romp in the Bronx against the A.L. New York team. Al Leiter rolled along to his 7th win of the year (7-1) as the Mets clobbered Roger Clemens for nine runs on ten hits, three walks & two HRs. 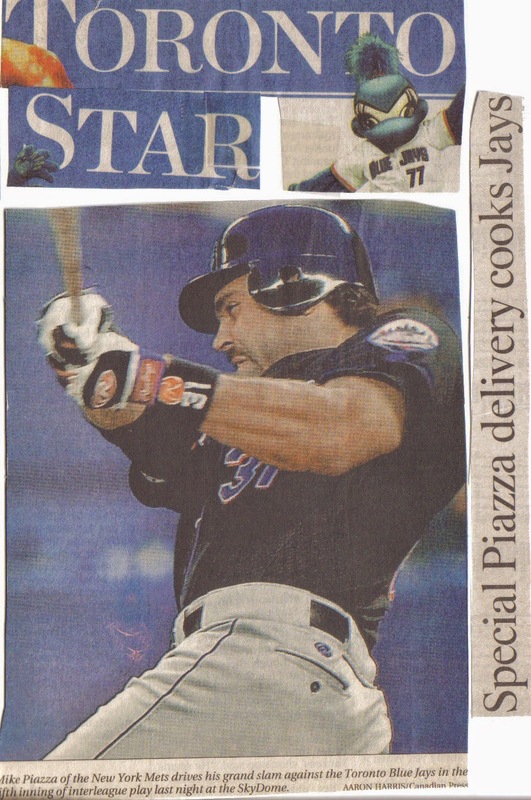 The biggest blow was a 3rd inning grand slam off the bat of Mike Piazza who always had a field day hitting against Clemens. Edgardo Alfonzo also homered, driving in two runs, Derek Bell drove in five runs & Todd Zeile an RBI as well. The Sunday game was rained out & a make up game was scheduled on July 8th, as a cross town day night double header. The first game played in the Bronx with the nightcap played in Queens. Dwight Gooden beat the Mets in the first game & it was in the second game where all the drama occurred. 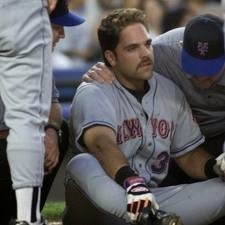 In the 2nd inning Mike Piazza came up against Roger Clemens & was hit in the head with a fastball. Piazza went down & was taken off the field, going on the disabled list. Clemens didn't know how else to stop Piazza from hitting him & possibly was suffering from a steroid rage that day. The classless move was looked at negatively from most people around baseball. The DH was as follows. Day game in Shea. Night game in the Bronx. I was at both.